Tracking the Juvenile Loggerhead - A True Survivor! Imagine clawing frantically at a hard protective shell that surrounds you and digging for days until you finally emerge into daylight. You locate the horizon and scramble over and around your brothers and sisters in hopes of reaching the water before being snatched up by a bird or hungry crab. After this enormous effort, you finally reach the cold ocean water. You start swimming away from the beach, into the ocean where Gulf Stream currents help carry you away from land. You travel in the currents until you are far away from shore. You will not return to the beach for many years or perhaps ever again - the ocean is your home now. Which marine animal begins their life this way? That's right - a loggerhead sea turtle! What you have just imagined is what hundreds of hatchling loggerhead sea turtles experience in their first few days of life out of the nest. From the very beginning of life, loggerhead sea turtles are survivors. After being swept away from the beach as tiny hatchlings, the turtles swim into the deep open ocean where they spend the next 10-14 years. In the North Atlantic Ocean, loggerheads turtles are carried away from shore in the Gulf Stream current. They drift through the ocean in the North Atlantic Gyre, a series of ocean currents that circulate throughout the ocean. During this period of their lives, turtles feed on organisms that live on the surface of the water, like jellyfish. Scientists do not know exactly where the turtles live and for how long when they are in the open ocean. However, they do know that once the juveniles are large enough, they move closer to the shore and feed on high-protein mollusks and crabs that live on the ocean floor. Large juvenile and adult turtles live along the coast and migrate between breeding and feeding grounds. Adult females will return to land every 2-3 years to bury their eggs. Signals of Spring is pleased to offer data on two 3-year-old juvenile Loggerhead turtles, named Hennessey and Zissou. 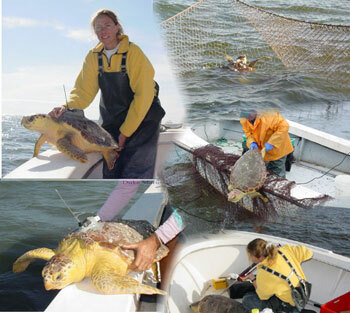 The data on these turtles is provided by Catherine McClellan, PhD student at Duke University Marine Laboratory. Ms. McClellan studies juvenile sea turtles and how they use different habitats. She is one of the few scientists studying the in-water movements of juveniles, most people focus on adult female turtles. Female turtles are the most accessible for scientists to study because when they are about 35 years-old they return to land to lay eggs. Male loggerhead turtles never return to land, so like juveniles there is little data on their life cycle. Signals of Spring students who are tracking Hennessey and Zissou will notice that they spend their time in the open ocean. These are only two of many turtles tracked by Ms. McClellan. Most of the turtles she tracks are older juveniles (10-20 years-old) that live in the bays and estuaries along the North Carolina coast. The older juvenile turtles usually have a satellite transmitter attached after having been caught in fishing gear. In early morning hours, Ms. McClellan joins local fishermen on their outings. She is ready in her small boat should the fishermen find a turtle in one of their nets. Fishing is allowed in the inshore bays and estuaries of North Carolina, where large juvenile turtles tend to feed. Unfortunately, turtles and fishing gear sometimes collide. Turtles may be caught in fishing gear such as gill nets, pound nets, long-haul seines, and shrimp trawling nets. When turtles become trapped in fishing gear they could drown if they cannot reach the surface to breathe. However, many times turtles are not badly hurt when they are caught in fishing gear. Ms. McClellan explains, "The turtles may be released without harm, or with minor to severe injuries. Turtles' may accidentally encounter fishing gear or seek it out for a free meal. We don't know a lot yet about the sub-lethal effects of being caught incidentally in fishing gear." When Ms. McClellan is present with the fishermen, she takes any juvenile turtle that is found on board her boat. She takes blood and skin samples to determine the gender and genetic stock of the turtle. She also records the turtle's weight and size. Then she attaches a satellite transmitter to the shell. Ms. McClellan cleans the shell, removing mud and hard barnacles that have attached themselves. She sands a small area of the turtles shell so that there are no rough edges. Finally, she attaches the transmitter with several layers of glue and lets it dry before returning the turtle to the water. Tracking the movement of juvenile turtles allows Ms. McClellan identify how they use ocean habitats in their early years of life and how they interact with fishing gear in coastal bays and estuaries. Commercial fishing is one of the largest threats to sea turtles. Ms. McClellan is able to use her data of sea turtle movement and interaction with fishing gear to help make recommendations for fisheries management. "Regulations based on sound scientific data are best for fisherman and sea turtles," explains Ms. McClellan. Signals of Spring students can join Ms. McClellan in her important research by keeping track of Hennessey and Zissou. Students can compare the behavior of these juvenile turtles to other, more mature loggerheads. Observations such as these, made possible by satellite tracking, will give scientists a better understanding of how juvenile loggerheads survive from their first few days of life through adulthood.